The Texas Memorial Museum is one of Austin's hidden treasures. Nestled on the UT campus, the "Dinosaur Museum" covers the history of Texas in geological and biological form. 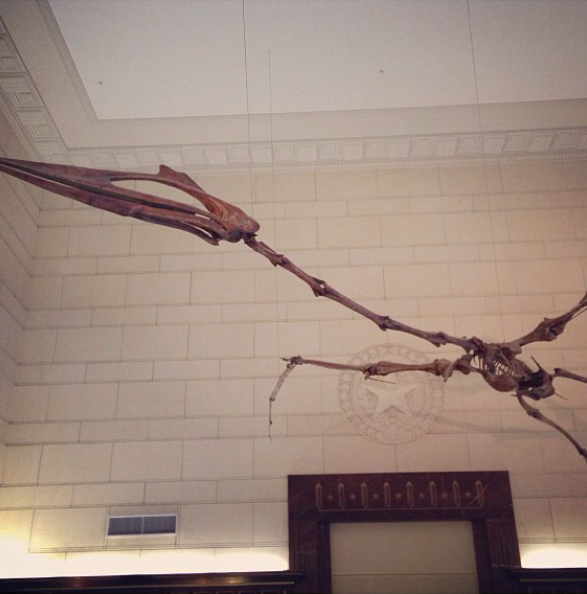 Upon entering, you're greeted by a Texas Pterosaur suspended over your head. 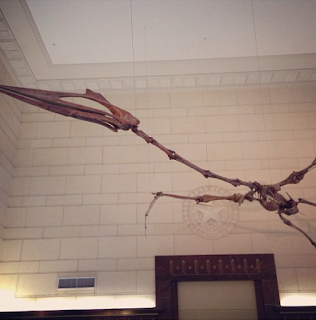 The 40-ft wingspan makes this the largest flying reptile that ever lived. Texas Memorial Museum has over 5 million specimens collected by UT students and faculty. You'll find everything from the terrifying bugs that can live in your backyard to the terrifying mountain lions that can live down the street from your home. Texas is awesome, y'all! After exploring four floors of wildlife, insects and gems, take a stroll outside where you can walk in the footsteps of the Glen Rose dinosaur tracks and have your photo taken with a replica of a sabre-tooth cat. And the back of the museum has a fun, graduated step area that takes you down to UT's "Mustangs" sculpture. Admission: FREE (donations welcome) We are celebrating the end of a successful school year with FREE admission to the museum! Museum exhibits open 9 a.m. to 5 p.m. and the activities run from 9 a.m. until 4 p.m. The dig pit will be open to young paleontologists from 10 a.m. to 4 p.m.
Fossil identifications will be available from 9 a.m. to noon and from 1 p.m. to 4 p.m. If there is a scout in your family working on a badge that includes a requirement to speak with a scientist, drop in at the Paleo Lab to chat with a paleontologist. Back by popular demand – an official TMM patch! Our new exclusive patch will be available in The Museum Store at a special price during the event. Hours: Tuesday–Saturday, 9 a.m.–5 p.m.
Click here for parking and for more information on visiting the museum.